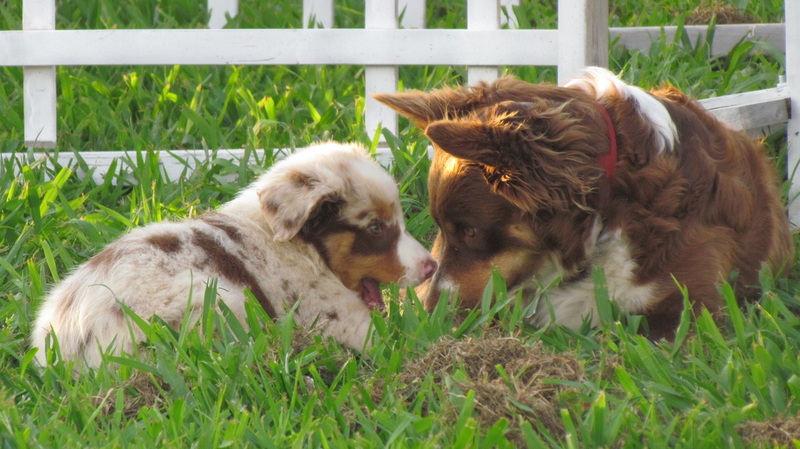 Australian Shepherds - WELCOME TO CEDAR CREEK RANCH! WELCOME TO CEDAR CREEK RANCH! We love Aussies, all colors, all sizes but we own and breed an occasional litter of standard sized Aussies. Our Aussie family consists of Rebel, the boss and mama Aussie of the place. We got her as a wee pup after being without an Aussie for over a year after our old Tessa passed on and hopefully, we'll never be without one again! Below is Rebel as a puppy herself then with one of her first puppies. Rebel is now spayed and only has to worry about her 'grand puppies'. Duchess, our mama dog. Very well bred and such a sweet girl! Dollar, our male. He is big and handsome. This was our last litter. They are all sold and have gone on to their new homes. We hope to have another litter in the spring of 2019!